Hypochondria is an ancient word. It stems from the Greek meaning for the upper abdomen; hypo- is the prefix for below, and -chondro refers to the ribs, so that the Greeks referred imaginatively to the upper abdomen as ‘the bit below the ribs.’ For the Greeks, the abdomen was felt to be the seat of melancholy, in the same way that we consider the heart to be the home of love. At some point in the history of medicine, this psychological association with the word hypochondria developed pre-eminence over its anatomical origins, and the condition of hypochondriasis was born. 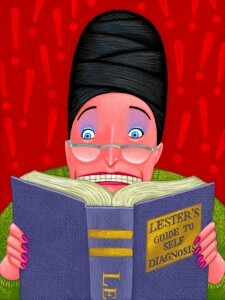 Since that time, however, hypochondria has taken a bashing. The problem starts with the fact that it makes such very good comedy. 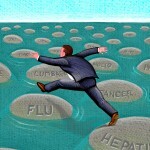 Whether it is an icon portrayal by a master of the art such as Tony Hancock, or throwaway one-liners like ‘Hypochondria is the only illness I don’t have’, the image of someone endlessly worried about their health is irresistible material for laughs. This I can handle – comedy is part of how we cope with the human condition, and we should never be so sensitive about illness that we are afraid to laugh at it. More of an issue, however, is when the condition is misunderstood – and unforgivably so, when this is done willfully. A particularly bad example of this was written in The Observer recently by the columnist Barbara Ellen. It may be that she is simply ignorant of the nature of hypochondriasis, in which case she is guilty of gross journalistic laziness, and should improve her research. However, with a sub-title that reads: ‘Hypochondriacs are themselves a pain – and they take up valuable surgery time,’ I suspect that she knew full well what she was doing and was happy to take cheap potshots in order to sell a story. The text of the article is even worse than the headline. Ellen was apparently trying to be on the side of doctors, empathising with why we might sometimes be tempted to prescribe a placebo. An article that alleges to understand my frustrations as a doctor has rarely left me so angry, but with outrageous claims like: ‘the fact remains that there is no known cure for the determined hypochondriac attention-junkie’ and ‘hypochondriacs are shameless liars’ the only way I was able to keep my blood pressure in check while I re-read her rant, was to remind myself that she is a professional journalist who has set out to shock and I shouldn’t take it too seriously. There is a serious side to this, however, which is that words affect attitudes, and attitudes drive behaviour. True hypochondria is a fearful and much stigmatised illness; the way we talk about it will influence the way doctors, patients and the public in general behave towards those affected, and at the very least I feel the need to try to redress the balance a little. At this stage I should say what I mean by hypochondria; it is easier to start with what it is not. It is not someone who worries a bit more than most about their health. Neither does it describe those among us who are – and there is no other way to say this – a bit of a wimp when it comes to suffering. Some of us do complain more than others, and our friends, families, and even our doctors, have to put up with this – but that is not hypochondria. Nor is it malingerers who make things up for personal gain – people who pretend to be ill in order to skive off work for a bit. Despite what the Government would like us to believe, I don’t think there are many people like that, but I would be naive to say that they do not exist – although they are not hypochondriacs. Most importantly, hypochondria does not refer to illness that cannot be explained by doctors – medically unexplained symptoms are common, and their causes many and varied, while hypochondria is rare and quite specific. A true hypochondriac really is worried that they are unwell. The illness is often focused on one fixed belief – a lump in the throat becomes a cancer, abdominal cramps can only be explained by a bowel infestation. The level of anxiety takes on an obsessional, even delusional, quality, with a constant drive to find an answer for the symptoms, and a need for reassurance that can become like an addiction. Just as an alcoholic finds his thirst is slated only for a while with a drink, so reassurance brings an all too temporary reduction in anxiety, and as soon as it wears off anxiety rises to overwhelming levels, with a search for more reassurance being the only offer of respite. A patient may check their body for changes 30, 60 or 100 times a day; it can dominate conversation with friends and family, exasperating all involved. The internet – always a mixed bag when it comes to health information – becomes a snare, with its 24-hour availability and tendency to promise answers, while usually delivering just more questions. Reassurance-seeking behaviour, inevitably, involves frequent trips to the doctor, A&E, specialist clinics, investigations – the risk from medical tests and treatments becomes a very real danger. This is a debilitating and life-controlling illness – hardly the domain of a lying, time-wasting whinger. The challenge with hypochondria is to help someone move from focusing on physical symptoms to an understanding of the nature of their anxiety. This is hard enough without having the very word for their illness mired in stigma, ridicule and misunderstanding. I suspect Hypochondria as a diagnostic label is now beyond rehabilitation – which is why the illness is often referred to today as health anxiety – but the word still exists in our popular vocabulary, and we should treat it with respect, because it will continue to represent the experience of real people with real lives. This article originally appeared on the Binscombe Doctor blog on 11 Apr 2013 and is reproduced with kind permission from Dr Martin Brunet. @Mental_Elf @docmartin68 This is an excellent, wholly justified response. Hypochondriasis is a most distressing condition. I heartily endorse this excellent response by Dr Brunet.